Following the success of the Avian Influenza Roadshow in October which was organised by the Poultry Health and Welfare Group, Veterinary Service Animal Health Group held a stakeholder meeting at the end of November. 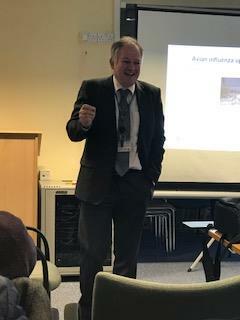 Opened by the Chief Vet, Robert Huey and attended by key stakeholders from across the poultry sector, the meeting provided industry with an update on Avian Influenza and the risk to Northern Ireland. Stakeholders were given extremely informative and useful presentations, covering a wide range of topics, including the risk of avian influenza incursions, bird migration patterns, biosecurity in practice and communications going forward. 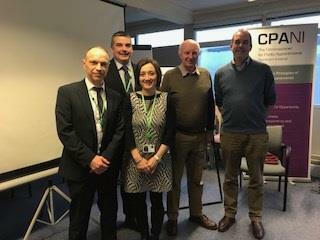 Presenters from left to right - David Cassells, Epizootic SPVO; Jim Blee, Head of Animal Disease Policy; Anastasia Georgaki, Veterinary Epidemiology Unit; Neil McCulloch, Departmental Ornithologist and Ian Stewart, Parklands Private Veterinary Practice.